Models #1 1bzm and #2 1urt associated with sequences in a multiple alignment, with ChimeraX selection sequence region. 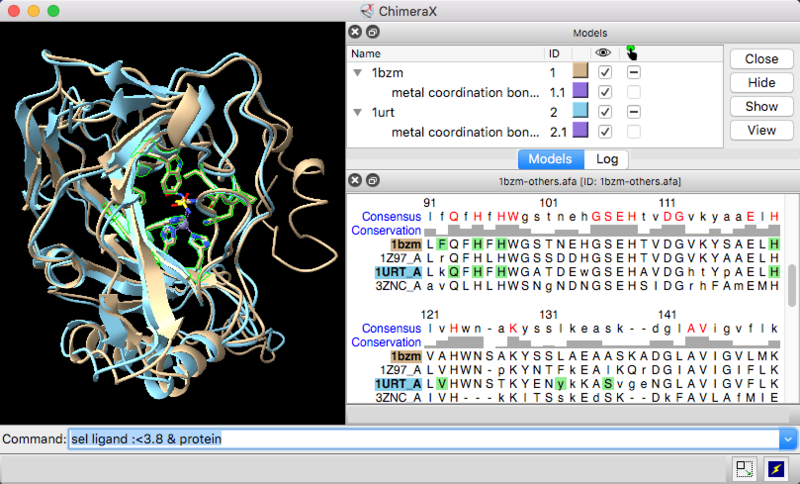 Multiple Sequence Viewer windows can be shown at the same time, and they can be manipulated like other panels in ChimeraX (more...). Settings... show the Sequence Viewer preferences to control wrapping, spacing, coloring, etc. Headers are the rows of information above the sequences: consensus sequence, conservation histogram, etc. Which headers are shown and how they are calculated can be controlled in the Headers settings. Sequence regions are colored boxes or outlines that enclose one or more residue symbols. A single region may contain any number of disjoint and/or abutting boxes. Pausing the cursor over a region (but not directly over a residue symbol) shows its name in a pop-up balloon. Some regions are created automatically, such as by association with a structure. Regions can also be created manually by dragging within the sequence window. Manually created regions are shown in this color (default, see Regions settings). The active region is the region most recently clicked or created by dragging. Shift-dragging with the left mouse button adds to the active region, whereas Ctrl-dragging creates a new region and makes it the active region. (On Mac, command key replaces Ctrl.) The active region is indicated with a dashed outline; clicking the active region deactivates it, and clicking a different region deactivates the former active region and makes the new region active. A region with no interior color is only responsive to clicks on its borders. A sequence that arose from a structure's chain information is automatically associated with that chain, with regions for protein structure helices and structure strands. Such sequences are closed when their structure chains are deleted or closed, and they are not automatically associated with other structures. Gaps in the structure sequence (relative to the sequence opened independently) are not allowed except where residues are missing from the structure, such as in disordered regions with poorly defined density. Insertions in the structure sequence relative to the sequence opened independently are not allowed. In the sequence window, regions may be created to show mismatches and missing residues according to the association. If a mismatch or missing residue only occurs in a subset of multiple associated structures, a pink box or gray outline is shown instead (default, see Regions settings). The settings window can be manipulated like other panels in the ChimeraX interface (more...). Save saves the current settings as preferences, Reset replaces the current settings with the initial “factory” defaults (values shown in bold below), and Restore restores values that were saved previously. The Buttons below... option indicates whether these buttons should apply only to the currently shown section (e.g., Appearance) or to all of the Sequence Viewer preferences. Although there can be multiple settings windows with different values for multiple Sequence Viewer windows, there can be only one set of saved preference values. The consensus sequence shows the residue type that is most common at each position in the alignment, even if it appears in less than 0.5 of the sequences; if a consensus type appears in at least the capitalization threshold fraction of sequences, it will be capitalized and shown in purple, or in red if all of the sequences have the same type. If several residue types are equally the most common, one is chosen at random. The consensus will show a gap at positions where a gap is the most prevalent or equally the most prevalent as one or more residue types, unless ignore gap characters is turned on. Regardless of this option, however, gap positions are always included in the denominator for calculating the consensus fraction. identity histogram - what proportion of the sequences have the most prevalent nongap character per alignment column. Histogram bar heights are proportional to (M-1)/(N-1), where M is the number of occurrences of the most prevalent residue type at a position in the alignment and N is the number of sequences in the alignment. Thus, if every sequence has a different residue at a given position, the bar height is zero, not 1/N. Averaging window (initial default 1) - window width, or how many alignment positions to average in a sliding window. The result is assigned to the central column of the window when the width is odd, the column left of center when the width is even (e.g., the fourth position in a window of 8), with various adjustments at the termini. The authors of AL2CO recommend a width of 3 for motif analyses. Conservation values from AL2CO are in standard deviations from the mean (Z-scores) and can range from –∞ (least conserved) to +∞ (most conserved). The Regions section of settings controls whether different types of regions should be shown, and if so, their initial colors. Each color well can be clicked to choose a color interactively. On/off checkboxes indicate whether to color the region border (box outline) and/or interior (box fill), whereas full and partial refer to whether the region applies to all structures associated with a position or to only some fraction of those structures.